Bank CEO On Tour - Cheesy Or Smart? Summary: One Northeast bank CEO went on a "listening tour". Find out what he heard and how it could help your bank. We thought it was interesting that today is National Cheese Doodle Day. Although it is not certain who the actual inventor of the cheese doodle (aka cheese puff) is, Morrie Yohai seems to get most of the credit. 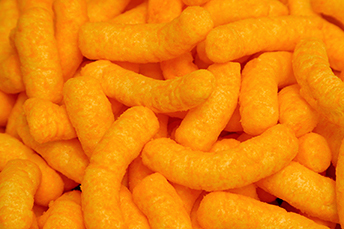 By the way, the world record for the most cheese puffs eaten in 20 seconds is 13 - about one every 1 1/2 seconds. We wouldn't encourage speed eating them, but having a bag of cheese puffs with lunch may not be a bad idea to celebrate today. As you munch on your bag of cheese puffs, ponder the question: how can community bankers best learn about the latest innovations - across many industries - that could transform their own institutions? One bank CEO in the Northeast took a "listening tour." He traveled across the country over a three-month period, visiting other banks, fintechs, retailers and other companies to learn not just best practices, but leading practices. This banker has already helped his institution forge a number of leading-edge ventures for both banking services and novel side businesses. These are now attracting attention from the industry and making the bank money. This CEO (and others) continually look for ideas and insight, to continuously embrace innovation and remain relevant. Do Not. These are things not to do. For example, it may not be cost effective for a community bank to invest in certain initiatives. Perhaps developing blockchain technology for banking services would not make sense, as larger companies are already pouring money into this technology so catching up isn't likely and forming a partnership down the road might be a better strategy. Do Now. These are areas to focus on. Perhaps a customer experience department headed by a "chief customer experience officer" makes sense. If so, put more resources into a dedicated department with a laser focus. For this CEO, doing so helped the bank overhaul its process for reissuing debit cards, so that it was more seamless and customer-friendly. Do Next. Great initiatives that will likely take 1-2Ys to fully develop and get right will go on this list. Here such things as omnichannel delivery might reside. It just takes time to get all channels to have the same look and feel, as you ensure your data is connected too. Do Beyond. These are things that are further out but hold great promise. Artificial intelligence (AI) holds great promise for banking - but realistically for the CEO's community bank, that's sometime in the future. As such, resources would be put to better use in other initiatives until AI within the banking world has further evolved perhaps. The CEO's listening tour was not only valuable for picking up new ideas, but it also helped the bank in other ways. It was a good time to test the bank's succession planning and business continuity plan, as other executives stepped in to manage the bank while the CEO was away. Another bonus: the CEO was able to connect to more of the bank's employees by writing a blog while on tour, including his travails and vulnerabilities, and how he handled them. Before going on a tour, you will want to first establish specific goals to accomplish and then prepare questions in advance. Above all - listen more than you talk. That way, the takeaways will likely pack a more powerful punch, and that's not just puff. The Treasury Department's Financial Crimes Enforcement Network (FinCEN) said it believes banks are restricting access to certain customers "because of misunderstandings about their compliance responsibilities" and that it is working to address uncertainty about regulatory expectations. Some 80% of banks surveyed by the GAO reportedly said they closed accounts for AML risk reasons and 80% said they do not offer accounts to customers considered high risk because of regulatory pressures. These actions by regulatory agencies over the years have pushed banks to de-risk customers in an effort to reduce the regulatory burden. The FDIC has filed a lawsuit against 16 large banks, as it seeks to collect on the costs of the Doral Bank failure of 2015. The FDIC argues these large banks manipulated LIBOR, which led to losses at the bank and thereby contributed to the bank's financial deterioration and failure. PwC reports 53% of surveyed US organizations say they have experienced fraud or economic crime in the past 2Ys, an increase of 38% vs. 2016. These crimes are described as "the theft of assets, business misconduct, cybercrime or consumer fraud, among other acts of wrongdoing".